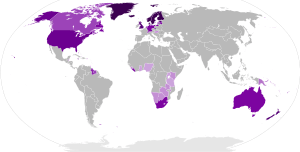 Countries by percentage of Protestants in 1938. 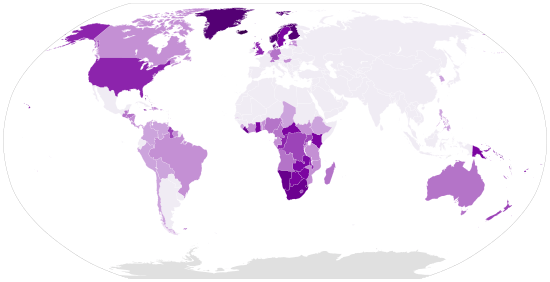 Countries by percentage of Protestants in 2010. 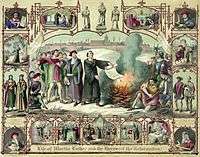 The Protestant Reformation began as an attempt to reform the Roman Catholic Church. Protestantism originated from the ideas of several theologians starting in the 12th century, although there could have been earlier cases of which there is no surviving evidence. However, these ideas were a subject to persecution by the Roman Catholic Church, and thus were kept isolated or effectively eradicated up to the 16th century. One of the early Protestant reformers was John Wycliffe, a theologian and an early proponent of reform in the 14th century. 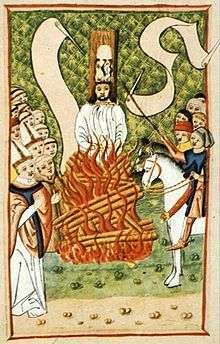 He influenced Jan Hus, a Czech priest from Prague, who in turn influenced German Martin Luther, who sparked the Protestant Reformation. 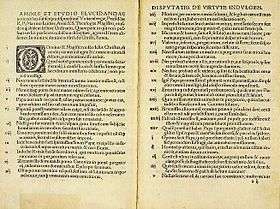 Martin Luther wrote Ninety-Five Theses on the sale of indulgences in 1517. 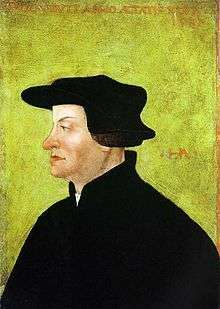 At the same time, a movement began in Switzerland under the leadership of Huldrych Zwingli. 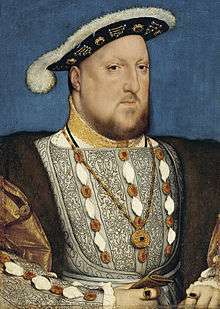 The political separation of the Church of England from Rome under Henry VIII brought England alongside the broad Reformation movement. The Scottish Reformation of 1560 decisively shaped the Church of Scotland. Following the excommunication of Luther, the Pope condemned the Reformation and its followers. 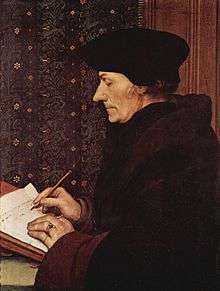 The work and writings of John Calvin helped establish a loose consensus among various groups in Switzerland, Scotland, the Netherlands, Hungary, Germany and elsewhere. 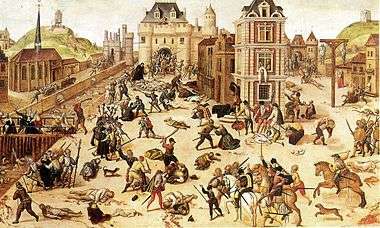 In the course of this religious upheaval, the German Peasants' War of 1524–1525 swept through Bavaria, Thuringia and Swabia. 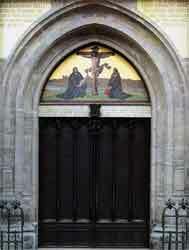 The confessional division of the states of the Holy Roman Empire eventually erupted in the Thirty Years' War of 1618–1648, leaving the agglomeration severely weakened. 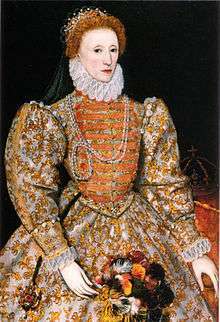 The success of the Counter-Reformation on the Continent and the growth of a Puritan party dedicated to further Protestant reform polarized the Elizabethan Age, although it was not until the Civil War of the 1640s that England underwent religious strife comparable to that which its neighbours had suffered some generations before. Nonconforming Protestants along with the Protestant refugees from continental Europe were the primary founders of the United States of America. The "Great Awakenings" were periods of rapid and dramatic religious revival in American religious history, from the 1730s to the mid-19th century. The result was a multitude of strong Protestant denominations, many quite new. In the 20th century, Protestantism, especially in the United States, was becoming increasingly fragmented. Both liberal and conservative splinter groups asrose, as well as a general secularization of Western society. 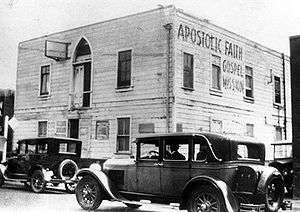 Notable developments in the 20th century of US Protestantism include the rise of Pentecostalism, Christian fundamentalism and Evangelicalism. While these movements spilled over to Europe to a limited degree, the development of Protestantism in Europe was more dominated by secularization, leading to an increasingly post-Christian Europe. Iconoclasm was caused by the Protestant rejection of the Roman Catholic saints. Zurich, 1524. Life of Martin Luther and the heroes of the Reformation. 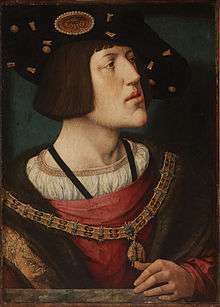 Charles V, Holy Roman Emperor opposed the Lutherans. Portrait of Philipp Melanchthon, co-founder of Lutheranism, by Lucas Cranach the Elder. Reformation and Counter Reformation in Europe. Protestant lands are in blue, Catholic in olive. 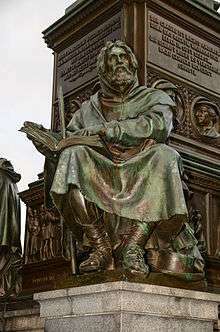 Martin Luther started the Reformation in Wittenberg, Electorate of Saxony, Holy Roman Empire in 1517. 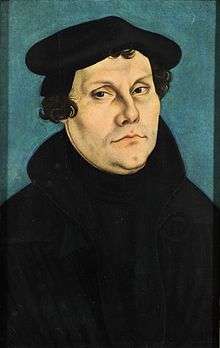 Martin Luther was a German monk, theologian, university professor, priest, father of Protestantism, and church reformer whose ideas started the Protestant Reformation. 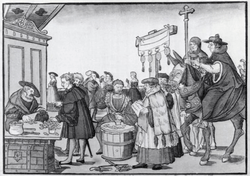 Albert of Mainz and Magdeburg procured the services of Johann Tetzel to sell the indulgences in his diocese. 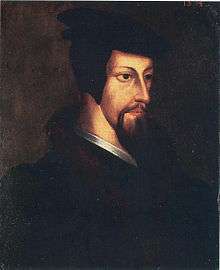 John Calvin was one of the leading figures of the Protestant Reformation. His legacy remains in a variety of churches. 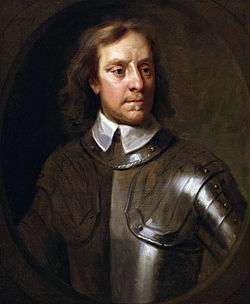 Oliver Cromwell was a devout Puritan and military leader, who came to power in the Commonwealth of England, Scotland and Ireland. 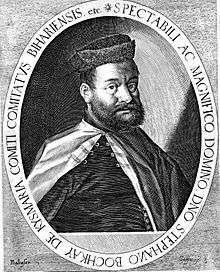 Stephen Bocskay prevented the Holy Roman Emperor from imposing Roman Catholicism on Hungarians with the help of the Ottomans. Historian Kenneth Scott Latourette argues that the outlook for Protestantism at the start of the 19th century was discouraging. It was a regional religion based in northwestern Europe, with an outpost in the sparsely settled United States. It was closely allied with government, as in Scandinavia, the Netherlands, Prussia, and especially Great Britain. The alliance came at the expense of independence, as the government made the basic policy decisions, down to such details as the salaries of ministers and location of new churches. The dominant intellectual currents of the Enlightenment promoted rationalism, and most Protestant leaders preached a sort of deism. Intellectually, the new methods of historical and anthropological study undermine automatic acceptance of biblical stories, as did the sciences of geology and biology. Industrialization was a strongly negative factor, as workers who moved to the city seldom joined churches. The gap between the church and the unchurched grew rapidly, and secular forces, based both in socialism and liberalism undermine the prestige of religion. Despite the negative forces, Protestantism demonstrated a striking vitality by 1900. Shrugging off Enlightenment rationalism, Protestants embraced romanticism, with the stress on the personal and the invisible. Entirely fresh ideas as expressed by Friedrich Schleiermacher, Soren Kierkegaard, Albrecht Ritschl and Adolf von Harnack restored the intellectual power of theology. There was more attention to historic creeds such as the Augsburg, the Heidelberg, and the Westminster confessions. The stirrings of pietism on the Continent, and evangelicalism in Britain expanded enormously, leading the devout away from an emphasis on formality and ritual and toward an inner sensibility toward personal relationship to Christ. From the religious point of view of the typical Protestant, major changes were underway in terms of a much more personalized religiosity that focused on the individual more than the church or the ceremony. The rationalism of the late 19th century faded away, and there was a new emphasis on the psychology and feeling of the individual, especially in terms of contemplating sinfuness, redemption, and the mysteries and the revelations of Christianity. Pietistic revivals were common among Protestants. Social activities, in education and in opposition to social vices such as slavery, alcoholism and poverty provided new opportunities for social service. Above all, worldwide missionary activity became a highly prized goal, proving quite successful in close cooperation with the imperialism of the British, German, and Dutch empires. In England, Anglicans emphasized the historically Catholic components of their heritage, as the High Church element reintroduced vestments and incense into their rituals, against the opposition of Low Church evangelicals. As the Oxford Movement began to advocate restoring traditional Catholic faith and practice to the Church of England (see Anglo-Catholicism), there was felt to be a need for a restoration of the monastic life. 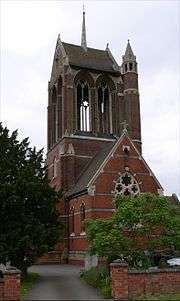 Anglican priest John Henry Newman established a community of men at Littlemore near Oxford in the 1840s. From then forward, there have been many communities of monks, friars, sisters, and nuns established within the Anglican Communion. In 1848, Mother Priscilla Lydia Sellon founded the Anglican Sisters of Charity and became the first woman to take religious vows within the Anglican Communion since the English Reformation. From the 1840s and throughout the following hundred years, religious orders for both men and women proliferated in Britain, America and elsewhere. Two main developments reshaped religion in Germany. Across the land, there was a movement to unite the larger Lutheran and the smaller Reformed Protestant churches. The churches themselves brought this about in Baden, Nassau, and Bavaria. 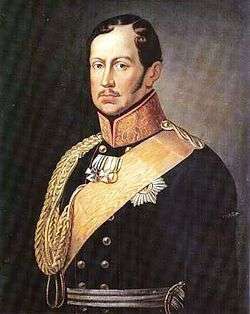 However, in Prussia King Frederick William III was determined to handle unification entirely on his own terms, without consultation. His goal was to unify the Protestant churches, and to impose a single standardized liturgy, organization and even architecture. The long-term goal was to have fully centralized royal control of all the Protestant churches. In a series of proclamations over several decades the Church of the Prussian Union was formed, bringing together the more numerous Lutherans, and the less numerous Reformed Protestants. The government of Prussia now had full control over church affairs, with the king himself recognized as the leading bishop. Opposition to unification came from the "Old Lutherans" in Silesia who clung tightly to the theological and liturgical forms they had followed since the days of Luther. The government attempted to crack down on them, so they went underground. Tens of thousands migrated, to South Australia, and especially to the United States, where they formed the Missouri Synod, which is still in operation as a conservative denomination. Finally in 1845 a new king Frederick William IV offered a general amnesty and allowed the Old Lutherans to form a separate church association with only nominal government control. The "Great Awakenings" were periods of rapid and dramatic religious revival in American religious history, beginning in the 1730s. The "First Great Awakening" (or sometimes "The Great Awakening") was a wave of religious enthusiasm among Protestants that swept the American colonies in the 1730s and 1740s, leaving a permanent impact on American religion. It emphasized the traditional Reformed virtues of Godly preaching, rudimentary liturgy, and a deep sense of personal guilt and redemption by Christ Jesus. It resulted from powerful preaching that deeply affected listeners (already church members) with a deep sense of personal guilt and salvation by Christ. Pulling away from ritual and ceremony, the Great Awakening made religion intensely personal to the average person by creating a deep sense of spiritual guilt and redemption. Historian Sydney E. Ahlstrom saw it as part of a "great international Protestant upheaval" that also created Pietism in Germany, the Evangelical Revival, and Methodism in England. It had a major impact in reshaping the Congregational, Presbyterian, Dutch Reformed, and German Reformed denominations, and strengthened the small Baptist and Methodist denominations. It brought Christianity to the slaves and was an apocalyptic event in New England that challenged established authority. It incited rancor and division between the old traditionalists who insisted on ritual and doctrine and the new revivalists. It had little impact on Anglicans and Quakers. 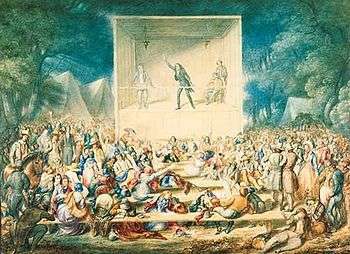 1839 Methodist camp meeting during the Second Great Awakening in the United States. 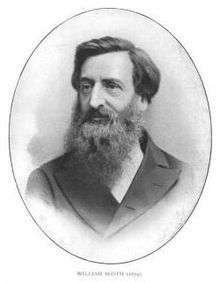 William Booth and his wife founded The Salvation Army during the Third Great Awakening. 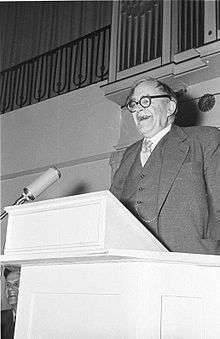 Karl Barth is often regarded as the greatest Protestant theologian of the twentieth century. 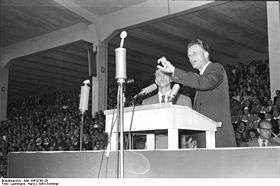 One of the prominent evangelical revivalists Billy Graham preaching in Duisburg, Germany, 1954. 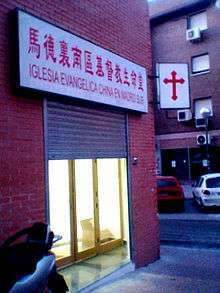 Chinese evangelical church in Madrid, Spain. Evangelicalism is a driving force behind the current rise of Protestantism, especially in the Global South. Evangelicals are as diverse as the names that appear—Billy Graham, Chuck Colson, J. Vernon McGee, John MacArthur, J.I. Packer, John R.W. Stott, Pat Robertson, Jimmy Carter, etc.—or even Evangelical institutions such as Dallas Theological Seminary (dispensationalist), Gordon-Conwell Theological Seminary (Boston), Trinity Evangelical Divinity School (Chicago), The Master's Seminary (California), Wheaton College (Illinois), the Christian Coalition, The Christian Embassy (Jerusalem), etc. Although there exists a diversity in the Evangelical community worldwide, the ties that bind all Evangelicals are still apparent. These include but are not limited to a high view of Scripture, belief in the Deity of Christ, the Trinity, salvation by grace alone through faith alone, and the bodily resurrection of Christ. In Europe there has been a general move away from religious observance and belief in Christian teachings and a move towards secularism. 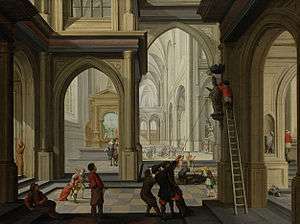 The "secularization of society", attributed to the time of the Enlightenment and its following years, is largely responsible for the spread of secularism. For example, the Gallup International Millennium Survey showed that only about one sixth of Europeans attend regular religious services, less than half gave God "high importance", and only about 40% believe in a "personal God". Nevertheless, the large majority considered that they "belong" to a religious denomination. 1 2 Article 1, of the Articles Declaratory of the Constitution of the Church of Scotland 1921 states 'The Church of Scotland adheres to the Scottish Reformation'. ↑ The Sacking of Rome & The English Reformation Archived 15 January 2009 at the Wayback Machine. ↑ Gstohl, Mark (2004). "The Magisterial Reformation". Theological Perspectives of the Reformation. Retrieved 2007-06-27. ↑ "Martin Luther: Biography." AllSands.com. 26 July 2008 http://www.allsands.com/potluck3/martinlutherbi_ugr_gn.htm>. ↑ "What ELCA Lutherans Believe." Evangelical Lutheran Church in America. 26 July 2008 . ↑ "Johann Tetzel," Encyclopædia Britannica, 2007: "Tetzel's experiences as a preacher of indulgences, especially between 1503 and 1510, led to his appointment as general commissioner by Albrecht, archbishop of Mainz, who, deeply in debt to pay for a large accumulation of benefices, had to contribute a considerable sum toward the rebuilding of St. Peter's Basilica in Rome. Albrecht obtained permission from Pope Leo X to conduct the sale of a special plenary indulgence (i.e., remission of the temporal punishment of sin), half of the proceeds of which Albrecht was to claim to pay the fees of his benefices. In effect, Tetzel became a salesman whose product was to cause a scandal in Germany that evolved into the greatest crisis (the Reformation) in the history of the Western church." ↑ Bainton, Roland. Here I Stand: a Life of Martin Luther. New York: Penguin, 1995, 60; Brecht, Martin. Martin Luther. tr. James L. Schaaf, Philadelphia: Fortress Press, 1985–93, 1:182; Kittelson, James. Luther The Reformer. Minneapolis: Augsburg Fortress Publishing House, 1986),104. ↑ Thomas Jay Williams, Priscilla Lydia Sellon: the restorer after three centuries of the religious life in the English church (SPCK, 1965). ↑ Matzko, John (2007). "The Encounter of the Young Joseph Smith with Presbyterianism". Dialogue: A Journal of Mormon Thought. 40 (3): 68–84. Presbyterian historian Matzko notes that "Oliver Cowdery claimed that Smith had been 'awakened' during a sermon by the Methodist minister George Lane." ↑ Jane Addams, Twenty Years at Hull House; Edmund Wilson, The American Earthquake.